The Hoadley Style Analyzer software applies the returns-based methodology, originally developed by William F Sharpe, to analyze the investment style of a mutual fund or other investment portfolio. This approach uses quadratic programming to determine the combination of positions in passive indices, style benchmarks, or asset classes that would best replicate the performance of a fund or investment portfolio over a specified time frame. Given the ready availability of free passive style returns data from organizations such as Russell Investment Group and Wilshire (for details, see Using the Style Analyzer), the Hoadley Style Analyzer provides a competitive alternative to those style analysis services which are only available through ongoing subscription. The two main outputs produced by Style Analyzer are the Fund Style Analysis and the Style History Analysis. Both outputs are shown graphically and in tabular form. This shows for the entire period of the returns (eg five years) the combination of passive benchmark weights which best explains the performance of the portfolio. The style history analysis uses a rolling window to examine how the fund's or portfolio's style has changed over time (style drift). This provides a powerful insight into the consistency of the fund or portfolio manager and, if the style has changed over time, an indication of how it has changed. The rolling window size can be specified by the user. Normally a window size of 24 to 36 months will smooth out short term anomalies and noise while still remaining sufficiently sensitive to longer term changes and trends. 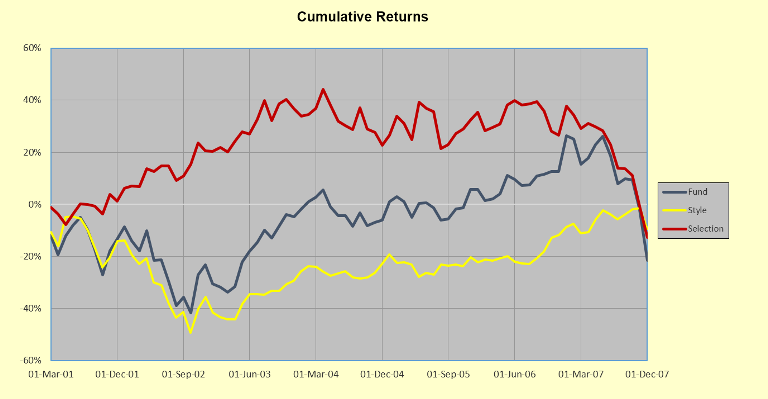 Cumulative returns for the fund, the style benchmark (systematic component), and for the selection (active component) over time are also depicted graphically on a historical cumulative returns chart. In the example below: fund -- blue line; style -- yellow line; selection -- red line. A drawdown is the loss incurred in a fund or portfolio from any high point in the fund's value until the fund recovers that value. The Style Analyzer produces a comprehensive drawdown analysis both in table and chart form. For instance, The "Time Under Water" chart (below) shows all drawdowns for the analysis period so that the maximum drawdown -- the drawdown size, duration, and duration of recovery -- can be viewed in the context of all drawdowns. A summary is also produced of the top three drawdowns in table form showing the amount, start date, end date, and recovery end date for each drawdown. Mean annualized returns, geometric (compounding) returns, and annualized volatilities for the fund, the individual passive benchmarks, the aggregate style benchmark, and the selection (tracking error). Beta and R-Squared of the fund in relation to the aggregate style benchmark. Percentage of the fund's performance due to active management (ie active risk exposure, which includes both active deviations from a beta of 1, and asset-specific, or residual, risk). Percentage of the fund's or portfolio's performance due to asset-specific factors only (ie residual risk exposure which is not correlated with the style benchmark). Selection Sharpe ratio (active information ratio) and T-Statistic. Performance measures based on lower partial moments (LPM) for the fund and for each of the passive benchmarks. Measures include Omega, Downside Deviation, Sortino Ratio, Kappa 3, and Upside Potential Ratio. The inputs to the Style Analyzer comprise the returns for the fund or portfolio, and the returns for each of the passive benchmarks. Normally monthly returns are used, but the application will accept data of any frequency. There are free sources of data available for the passive style benchmarks, as well as subscription services. Two free sources which provide facilities to download monthly returns data to CSV or XLS files are Wilshire and Russell Investments. Any number of benchmarks can be used. Examples of benchmarks include growth, value, large cap, small cap, small cap growth, small cap value. To use the Style Analyzer you simply copy the returns for the fund and relevant benchmarks to the Style Analyzer's data sheets and click one button. The Style Analyzer also supports batch processing of multiple funds. In "batch mode" style analyses for multiple funds are produced with a single button click. Results are exported to a new workbook, with the style analysis for each fund contained on a separate worksheet (tab). The Hoadley Style analyzer application is included in the price of the Finance Add-in for Excel. When purchased under a private-use license the number of returns that can be processed by the application is limited to 12, or a maximum of one year's worth of returns, and the number of assets is limited to ten. To handle more than ten assets, more than 12 returns and more than one year's worth of returns a corporate/commercial license is required for businesses (Commercial licensing enquiries) or a "Pro" license for private investors ("Pro" licensing enquiries). The Hoadley Finance Add-in for Excel version 10.1f or later must be installed before using the Style Analyzer. The Hoadley Style Analyzer is free and is included in the same download file as the Hoadley Portfolio Optimizer. However it requires the full version of the Hoadley Finance Add-in for Excel.